Stocks that pay you just for owning them can be great long-term contributors to any portfolio. Whether you're looking to diversify your holdings or buy stocks now that don't need babysitting, dividend stocks are great tools for individual investors to meet their goals. But there is one thing better than dividend stocks -- cheap dividend stocks. For various reasons, Mr. Market is keeping a lid on the valuations of General Motors (NYSE: GM), Total SA (NYSE: TOT), and U.S. Silica Holdings (NYSE: SLCA). While there are reasons to do so, the long-term opportunities for each company make them difficult to pass up right now. 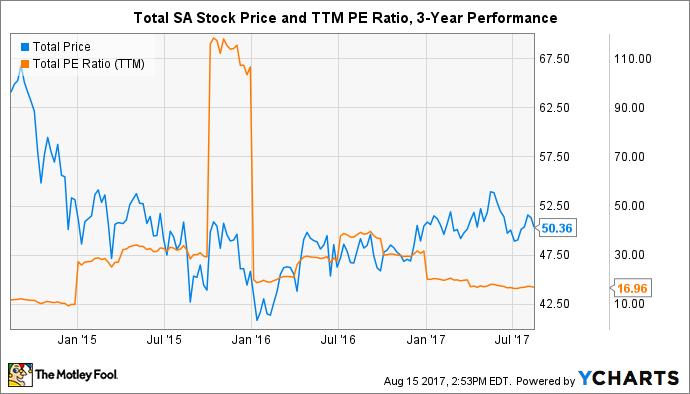 Here's why you should consider buying these cheap dividend stocks right now. Why Are Major Automakers So Cheap? 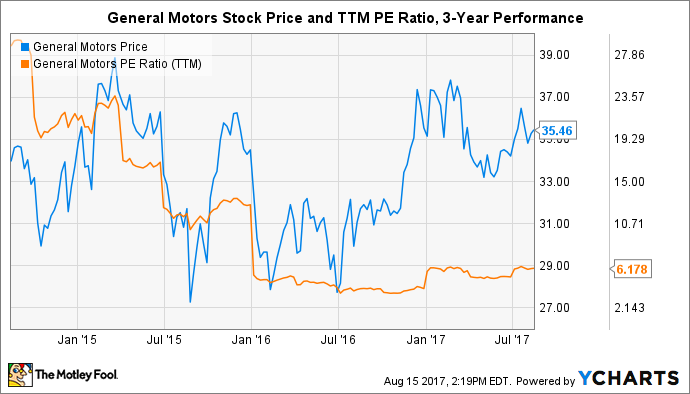 General Motors is trading at a historically cheap valuation based on trailing earnings. That's despite owning a historically strong balance sheet boasting a $16.5 billion cash pile at the end of June and robust operating cash flow that turned in $16.5 billion from operations last year. The company's health allows it to pay a dividend yielding a gaudy 4.3% at current levels. Better yet, the company believes operations are efficient enough to maintain the dividend and deliver healthy (albeit lower) profits during the next major down cycle. Good news considering auto sales may have peaked for the current cycle. Since General Motors is trading at just under 6 times trailing earnings, the company would still be historically cheap if profits were chopped in half (resulting in a valuation of 12 times trailing earnings). And it's not just cheap today: The stock is trading at 6 times earnings expectations in the next 12 months. Then again, as far as income investors are concerned, the commitment to maintain the dividend at current levels even in a pretty ugly downturn should be a strong argument to buy this dividend stock. Throw in industry-leading investments in next-generation technology platforms such as electric vehicles and fuel cell manufacturing for hydrogen vehicles, and it's even more difficult to pass up General Motors stock at current prices. French energy giant Total is easy for American investors to overlook, but don't forget that it's one of the largest energy companies in the world. It also turned in one of the best overall performances in the oil and gas sector in the first half of 2017. Adjusted net income from oil exploration and production grew 92%; gas, renewables, and power grew 34%; and the entire company grew 32% compared to the year-ago period. That helped to push its valuation to a historically low 17 times trailing earnings. Based on earnings expectations for the next 12 months, Total stock is currently trading at just 11 times future earnings. It has almost never been cheaper -- a scary thing to say for a dividend stock yielding 5.3%. While most of the year-over-year gains in the first half of 2017 were driven by improvements in the price of crude oil, Total is focused on major long-term opportunities outside of liquid hydrocarbons. This year alone, the company has announced projects that will use ethane from natural as a petrochemical feedstock (instead of costlier naphtha), agreements to supply Northeast and Southeast Asia with liquefied natural gas, the start-up of a solar power plant in Japan the beginning of construction of another, and the acquisition of Europe's third-largest natural gas transportation fuel provider. Simply put, Total can thrive in a low-price oil environment while still investing in future opportunities in natural gas and renewables. That makes it a top cheap dividend stock for any investor's portfolio. 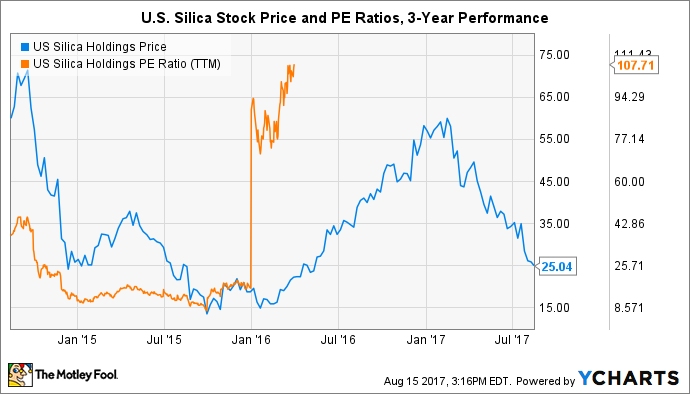 U.S. Silica may have posted negative earnings in the last 12 months, but the stock is incredibly cheap based on future projections for the next 12 months. In fact, the stock is trading at just 8.5 times forward earnings -- near the all-time low of 7.5 times earnings set in 2013 and 2015. That's certainly good news for opportunistic investors, but Mr. Market has forced the stock into a steady slide in 2017. The tumbling share price doesn't make sense when you look further into the numbers. Fewer oil and gas wells are being drilled in America's Big Four shale plays, but well count is already an outdated metric. New drilling, completion, and extraction technologies are breathing new life into American shale, even allowing producers to refrac old sites. Besides, new technologies haven't changed one of the easiest remedies for boosting production: add sand. A lot of sand. That has resulted in booming business for U.S. Silica, which sold a record 2.7 million tons of sand to oil and gas customers in the second quarter of 2017. That allowed it to generate $100 million in operating cash flow during the three-month period -- more than in all of 2015 and 2016 combined. This is all before the company's new frac sand facility in the Permian Basin has been completed. Simply put, if things keep humming along -- and all indications are that they will -- then U.S. Silica is on track to return the amount of cash paid in dividends to historical levels (or higher). That could result in a dividend boost of 35% from current levels. Why is Mr. Market choosing to keep these dividend stocks at relatively low valuations? No one knows! But opportunistic investors looking to buy great companies at great prices and hold forever should definitely give General Motors, Total, and U.S. Silica a closer look.